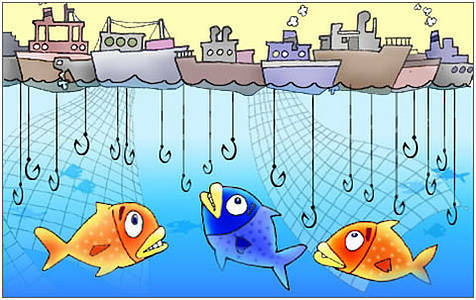 Today’s New York Times has an editorial on the recent decision of the USA National Oceanic and Atmospheric Administration (more particularly, the National Marine Fisheries Service [NMFS]) to set annual catch limits for all fishes managed by the agency. Some 500 in all. Please, let Beel present that editorial to you here. The New York Times concludes its editorial, “Annual limits are the most responsible way to ensure that there will be fish — and fishing jobs — in the future.” Beel concurs, although there is dissenting opinion (here), NMFS has traditionally been slow to enact restrictive regulations, in large part because of commerical interests that are too well represented on fisheries councils, but it is well past time to err on the side of the resource. When allowed to do its job, NMFS has been effective. Beel offers the recovery of Atlantic Coast striped bass stocks as an example. This entry was posted on January 21, 2012 by denstormer in Commentary.